Romance-a-holics by nature, Leos love being in love, and your proud, flamboyant sign wants the whole world to know when you are. Some of the most high profile romances have been between two Leos, like Madonna and Sean Penn, Ben Affleck and Jennifer Lopez (a.k.a. “Bennifer”), Antonio Banderas and Melanie Griffith, and Bill Clinton and Monica Lewinsky. Plain and simple, Leos love drama — in fact, your sign rules it. Unless there ‘s romance and fireworks that light up the sky, you want no part of the relationship. Red roses, poetry, expensive gifts…you’ll take it all. Spoiling and being spoiled are the name of the game. Still, the number-one addiction for a Leo is attention. A person can keep you hooked for years by giving you intense doses of it, then pulling it away, leaving you chasing desperately after another fix. Although you’re totally together with your career and family, your love life may read like a bad soap opera. Friends cringe at your romantic choices, and you may even lose a few pals to your drama. Beware of this cycle, as it’s extremely difficult for Leos to break! Leos rule the jungle, and you’re the boss in all you do. Because you’re so powerful, it can be hard for you to find a mate who can keep up. As long as your mate makes you feel like royalty, you don’t care if s/he’s a dysfunctional loser, or a few notches below your level — you’ll still design a throne to match yours. A little worship goes a long way. In fact, you may secretly prefer it that way. Watch out though, because your royal treasures can be drained by playing Sugar Mama/Daddy. Dig deeper if you find yourself caught up in this cycle. It may feel exciting (at first) to have a kept person in your life, but lurking below the surface are your own control issues. When you pay, you have the say—but you can also lose your attraction and respect. How about being with someone who can pull their own weight AND participate in a fair and equal dynamic? It IS possible, so hold out for another superstar instead of settling. 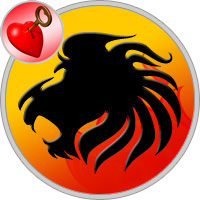 Check Leo Love Match for better soul connection. Love for the Leo is : romance – bright, frothy and beautiful – akin to movies/ fairy tales. A Lion loves the idea of ‘being in love’, and it’s the very feeling of being in love, of loving and loved that infuses in them so much positivity and vitality. It’s also about not loving someone else, but oneself, and the whole world, at large. In the sense that the Lion manages to draw enjoyment and fulfilment out of loving without ties, without conditions and without expectations. But then, that is ideal, and Leo does demand returns. Lion’s urge for power and dominance finds its way in the domain of love too. Leos like submission, and crave assurance. Never the ones to shirk away from giving generously, they do demand that gratitude be expressed with candour and affections be returned with reverence. Know how to Leo Flirting for maximum attraction & dating success. Leos in Love are supremely ardent, affectionate, loving and amorous. They love pampering their loved ones with open displays of affection, royal treatment, magnanimous gestures – you name it. But, also expect ample doses of praises and thank-you’s in return. Although, they possess all the qualities of a great life partner, are extremely supportive, strong and benevolent, they can be very taxing as lovers. You can also read more about Leo in Marriage to know what to expect from this Sun Sign as a husband or wife. They prefer being in the driving seat in a relationship, and their pride, though overt and bountiful, is still very fragile. Leos make doting, proud partners, but in return from their partners they crave unfailing loyalty, strength of character, love bordering on to reverence, silent submission to their (often) raging temper and dominance.